● Eggs — 3-4 PCs. 2. Separate the yolks from the whites. The whisk yolks with sugar. Then add sour cream and melted butter. Mix with a mixer. Add flour mixed with soda. Mix again. 3. Whip the egg whites and gently stirring, type in the dough. 4. Detachable form grease with oil. Put the dough and bake in a preheated 180-190ᵒС the oven for about 40 minutes. 5. Strawberries pour 2-3 spoons of sugar and leave for about half an hour to berries gave the juice. 7. Carefully cut into two shortcake. 8. 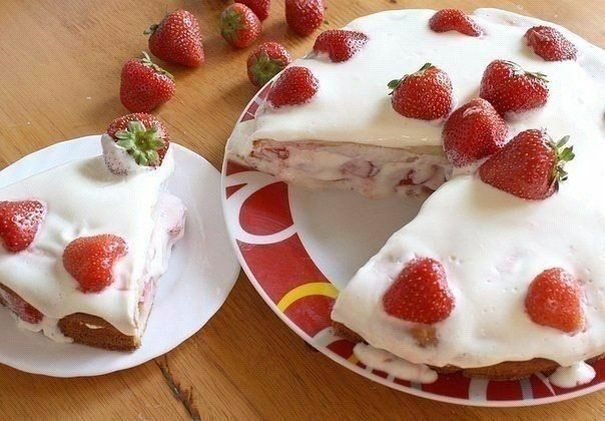 Soak each cake layer with the juice from the strawberries. 9. The lower layer lay out the strawberries. Large berries cut in half. 10. Whisk sour cream with sugar powder. Received the cream over the strawberries. 11. Cover with second layer. Then put the remaining sour cream and powder. Garnish with berries. Give an hour or two to soak (preferably in the fridge).